For weeks, I've had the ideas for this post rattling in my head. I have many ideas about using data, and I hope I make sense in weaving them together in this blog post. In working with our school's staff on learning more about our state report card and making sense of the new ACT Aspire data, we've been having conversations about school-wide data, what it means for us as a group, what it measures, etc. 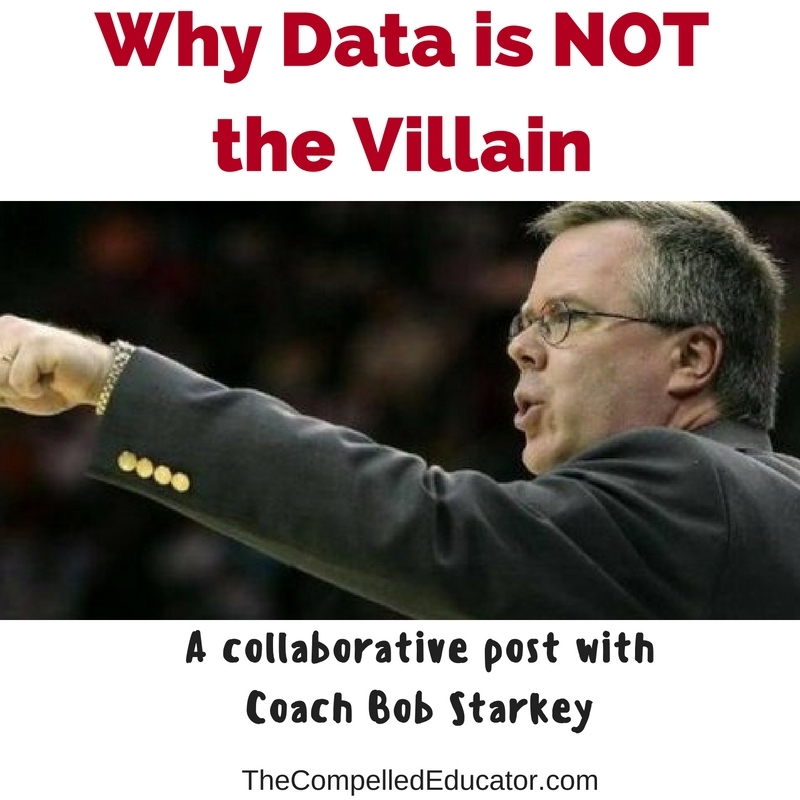 Several teachers have "villainized" the data and/or the test, which leads me to ask, "Is the data a villain or is it necessary?" In trying to wrap my brain around the myriad of thoughts, I reached out to my good friend and college basketball coach, Bob Starkey. I tend to lean on my coaching and athletic background as I navigate my personal and professional world, and as a former coach, I had questions and analogies about using data to evaluate current success and predict future success. I knew that coaches can tend to over-estimate what athletes can do by over-shadowing the athletes' performance results with practice behaviors. What do I mean by that? Athletes who show up to practice early, nod in agreement, pay attention, hustle on and off the court/field, and give consistent effort tend to "rate higher" in a coach's mind about how the athlete is actually performing. Sometimes when/if coaches look at a data breakdown, there are surprises in whether or not an athlete is actually accomplishing goals and making an impact towards reaching a goal. What does this look like in the classroom? Sometimes we confuse "doing school" with learning. Students who arrive on time, sit quietly in their desks, say "yes ma'am" and "no, sir," write neatly, participate in class discussions, etc. are often the students that we think of as those who are doing the learning. Sometimes we are surprised when these students don't do well on assessments and we want to blame the tests. Or we simply can't make a connection of why they did poorly. Sometimes we really don't know where are kids are academically. What did Coach Starkey have to say? Quite a lot. So I'm just going to paste his comments below, and ask you how it relates to your school/classroom/district. In coaching, statistics are important but there is a specific way to handle them in my opinion. Most fans think of stats as a game event but we actually take detailed stats during individual workouts with our players in the off-season as well as during our practices. Another important teaching characteristic is that of possessing an imagination. 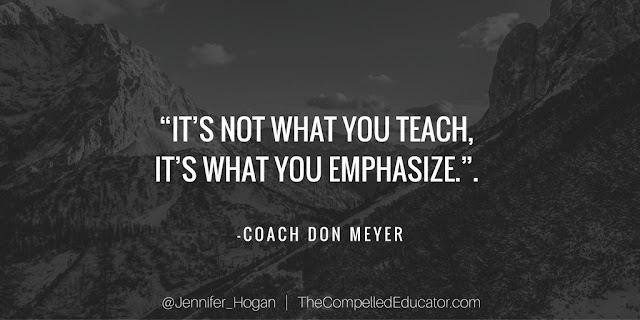 We often talk about how important it is for a student but it’s just as essential for a teacher I believe. Being able to look at what and how to measure a student’s growth can be important. Keeping statistics in certain areas creates your program’s points of emphasis. For instance, while most fans know the media’s stats of points scored and rebounds and assists, we create stats for things that are important to the success of our team but not necessarily something the media/fans care about. One such stat that we’ve kept on some of my past teams was the number of screens set to get a teammate open. While fans may not care about that, it is important to the success of our offense. It also allows us to create some value to something for a player that might not score points but is still critical to our success. The other thing about stats is that they are adjustable in terms of goals and growth. We have a shooting drill called the Mikan Drill which take a minute to perform. We never do the drill without counting her makes during that minute. For a new player we can a goal of 30. Once that goal is achieved, we can move it up a few more...and a few more. Of course, stats alone can’t take the place of teaching itself. But when properly utilized, I think they can help the teacher better pinpoint areas in which the student needs help. We chart turnovers and we are specific. So after a practice or a game, if we see Jill has 5 turnovers and 4 of them were bad passes into the low post (which would be on that stat sheet), we can then show her some video of her performing that particular pass — both successful and unsuccessfully — while outline teaching points...the next day in practice, we can have some drills to specifically work on that skill. If we didn’t chart that area, we may not realize that she needs help. One of my former players, Temeka Johnson, started her own foundation that raises money for Smart Boards for classrooms in Louisiana. I am on her Board of Directors and she took me to a school to witness, at least in part, some of the benefits. One that impressed was that instead of a teacher asking a question and calling on one student to answer, all of the students answered with their remotes and the data was recorded. Instead of a shy kid who may be struggling falling through the cracks until test time, the teacher had this information constantly at her hands. Of course, stats alone aren’t the answer...relationships and communication are huge. 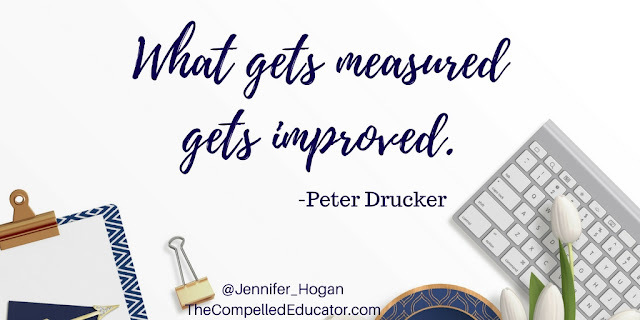 Still, being able to measure progress is so important – as well as how you present those results to your students. So not only can data measure, but it can create more specific means of communication I believe. Are we collecting data in the classroom that will predict outcomes? How are you using data at your school or in your classroom? I have a common core aligned writing rubric that I use throughout the entire year to measure student growth in my composition class. I used the data from the 4 categories on the rubric to group students, to target tutoring for students, etc. I found they all improved, mostly because they knew which standards were important. What does "homework completion" really say about a student, except maybe their compliance level? Thank you for sharing. I agree that what we emphasize is so important. We also struggle with the data and we have just started what we call "Priorities Project". We are trying to take the Comon Core and be intentional in what we emphasis. If everything is a priority nothing is...so we are are narrowing the focus. The data will help measure our effectiveness. Keep up the motivating posts!